My foodie friends and I were invited to a lovely Filipino restaurant in Glorietta interestingly named Dekada Historic Filipino Cuisine. Opened on June 12, 2013, Dekada is a tribute to the country's historic events and Filipino heroes. The place is also a tribute to historic decades, from the Spanish era to the 90s. Owned by the same owners of Teddy's Bigger Burgers, Boqueria and Sumo Sam, Dekada serves traditional Filipino food creatively named after popular figures in our history. During our visit, we were served one of the Family Fiesta Sets, the Magwagi (Php 1999). Magwagi has these dishes: Yamashita (Sinigang na Sugpo sa Kamias), Aguinaldo (Twice-Cooked Adobo), Dominicano (Adobo Rice), Sakay (Bicol Express), Murphy (Crispy Pla-Pla with Eggplant), Rizal (Lechon Manok) and Laguna Salad. The Sinigang's broth was quite generous and more than enough for 4 persons. I thought the Twice Cooked Adobo's beef needed more cooking time since it was a bit tough for me. We loved the Adobo Rice that I couldn't stop myself from getting more. I particularly loved their deconstructed version of Bicol Express as well, which has the right amount of heat in it. The Lechon Manok, however, either needed more flavor or a better sauce with it. Never miss the Crispy Pla-Pla and the Laguna Salad, with ripe mango and green mango on it. I was overall impressed with the concept of Dekada, the service was impeccable (shoutout to our servers Luningning and Magarbo), the food was delicious, save for some dishes that needed some tweaking. Still, I would love to visit again, and try more dishes and desserts next time. Thanks to Marcie Linao and Dekada for having us. And thanks Mich for inviting me. When you said I don't have to blog about it I wasn't planning on doing that anymore, but when we went there and was able to eat their food, I knew it's something that I'd have to share to my readers. Will share my own thoughts in my own blog soon! Wow, that Magwagi is really a winner! 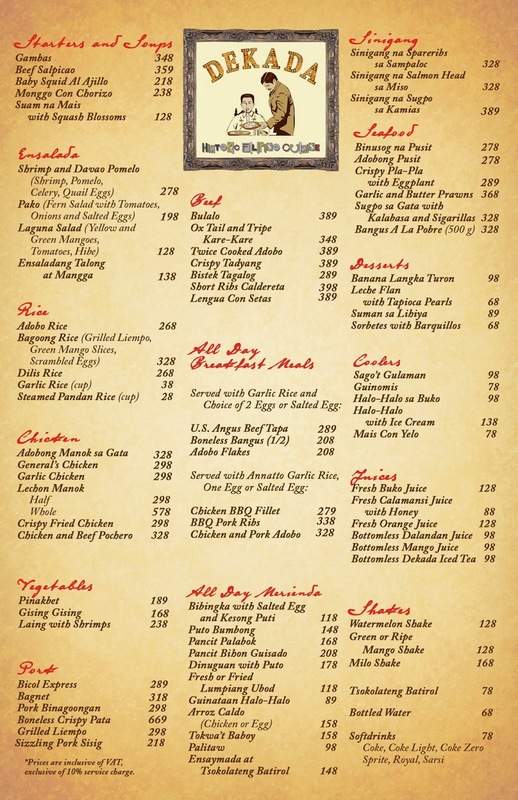 It's great that there are a lot of restos specializing on Filipino cuisine these days. I love the name of the dishes, playful but very Pinoy.